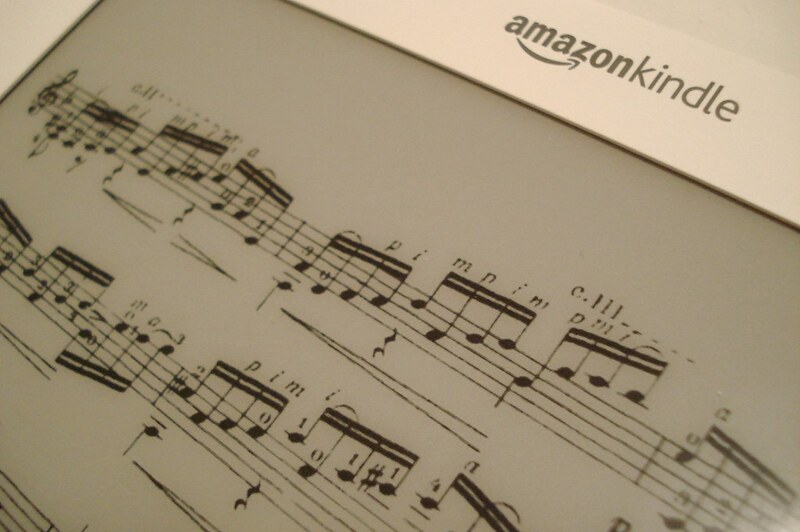 Life on the String: Why Amazon Kindle DX is Awesome for Musicians! 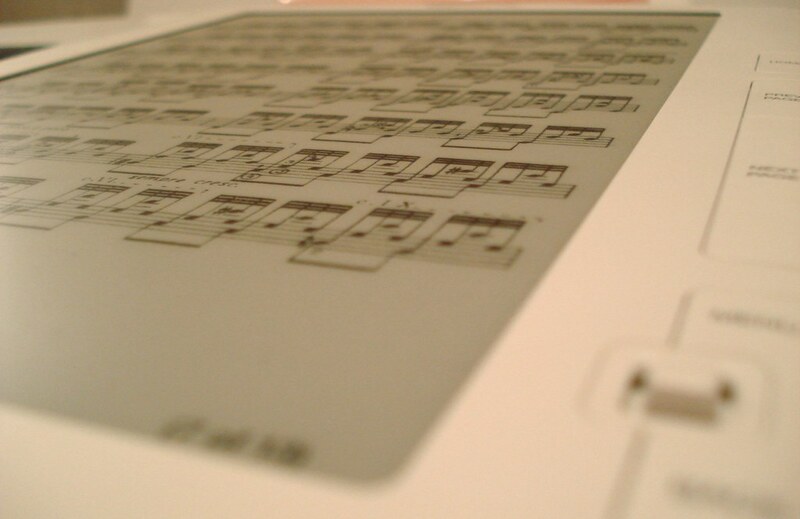 Why Amazon Kindle DX is Awesome for Musicians! I received an Amazon Kindle DX from my father as a Christmas gift. I was a bit skeptical when I first held it in my hands since I could hardly come up with any usefulness of this new device. I am not a good reader. I read some novels, but most of my readings are concentrated on the areas of my study like physics textbooks or whatever. Even if I could download textbooks into my Kindle DX, I don't want to bring it into classes drawing everyone's attention. After a while I realized that this little device is capable of displaying pdf files directly on its screen! Being as a guitar player who always carries around 2-3 binders about 1.5 inches thick just for music sheets, all of sudden I started to see a tremendous potential in it. What if I scan all of the musics in the binders and put them into the Kindle as well as other pdf music files that I was going to print anyway. 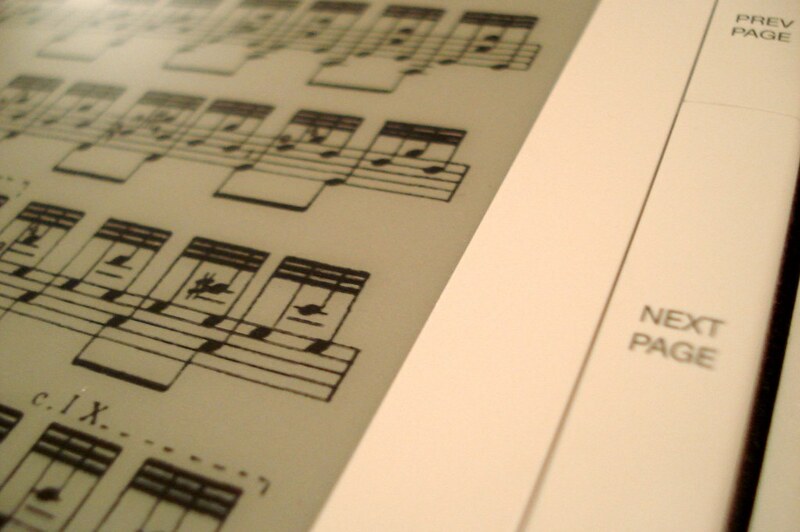 I should be able to read music easily because of its reasonable display size and, most of all, the so-called electronic ink technology will make the screen look as if it is "printed" on a sheet of paper. I hooked it up to my laptop and after playing with it a little while I was able to get a solid, beautiful screen that shows Francisco Tarrega's delightful piece, "Variation on a Theme of Traviata." How marvelous it is. It flawlessly showed Chaconne, a guitar transcription of Johann Sebastian Bach's composition for violin. 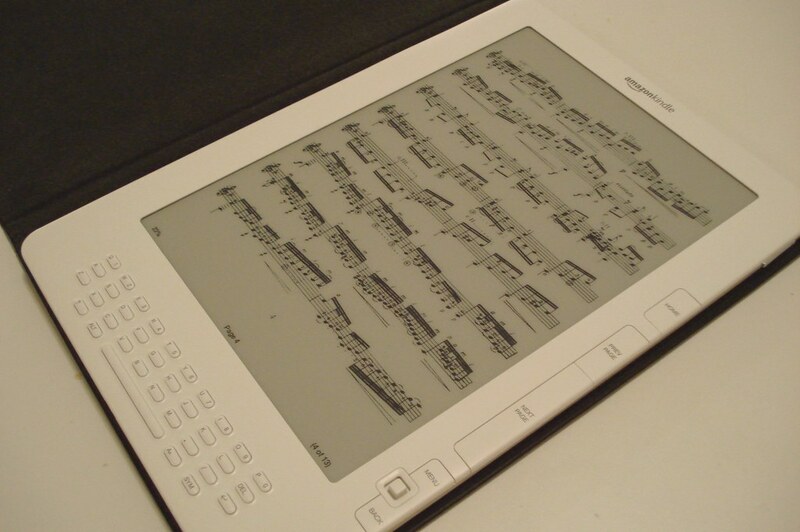 Another advantage of putting music sheets into a Kindle is that it does not require a player to literally "flip" the pages as the music continues onto the next page. All I have to do is to simply push a button (by fingers or tip of nose,.. whatever means possible). This is a real time saver since it has always been a bothersome burden for any music players to flip the pages in the middle of practicing/playing which often results in frequent interruptions in playing. Now I only carry one kindle that contains musics from all my five binders and plus some more. Only one disadvantage of using a Kindle that I noticed in a first hand is impossibility to take a note on a page. Sometimes, I need to write some fingerings down in order to remember and find ideal finger positions. Kindle does not allow me to write down anything on a pdf files. Kindle DX has a display that shows things as if they are printed. 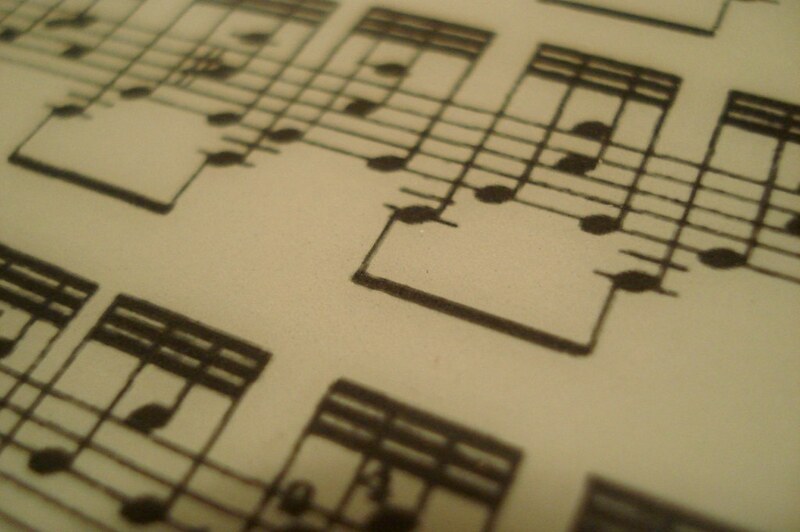 It really is no different than a printed music sheets. It does not loose resolution even in an extreme angle of view such as this one. A close up of the display showing details.